I can hardly wait for the race! You will participate in the 3rd Kids Fly Tri, August 19th. Transition opens at 0630 and closes at 0745. Pre race announcements will be at 0745; the gun will go off for the Mach 3s at 0800. For those of you who have selected this race as your first triathlon, I want you to know I will be cheering for you every step. I want this experience to be a great introduction to the sport of triathlon, so try to relax and enjoy every second of the day. A big thank you to the race sponsors who have donated time, money and products to make this race a reality. Also, three cheers to the numerous volunteers giving their time and efforts. “Thank you” doesn’t seem like enough, so Wooo Hooo!!! Packet Pickup: 1400-1800 (2pm-6pm) at the US Space and Rocket Center Aviation Challenge on August 18th. Follow the signs to the Rocket Center/Aviation Challenge. You'll pass a parking lot and go through a big gate. There will be a "bubble" on the left and a parking lot on the right. Park in the lot and head into the bubble. You will see a sign for Packet Pick up on the door that will be to your right. Iceworks will be there from about 1630-1800. If you are there between those hours, grab a shaved ice or lemonade (menu attached) to enjoy while you watch the short (8 minute) pre-race briefing video. Race day packet pick up only available by special request. Email kidsflytri@gmail.com. You will need your packet before you check in on Race Day. The bubble: This is race central. Check in, transition, spectator bleachers—it all happens right here! If you have any questions please look for volunteers wearing bright teal bandanas, or for captains wearing grey Fly Tri shirts, or for me…probably the only one in a cowboy hat! We are here to make your day safe, fun and successful! Parking: Athletes and spectators will park in the lot outside the gate. Volunteers can park in the lot across from the bubble. Reminder: If you are on your bike, your helmet must be on your head and securely fastened—even before and after the race. Participants will be disqualified for not wearing a helmet at any time before or after the race, and will not be allowed to race without it. Manic Organic will be serving breakfast and lunch items. Iceworks will be serving shaved ice and lemonade. Bathrooms are located inside the bubble. There will be a sign on the door. Ladies are on the left (marked “powder room”) and men on the right. There are also showers and a changing area in there. Helmet check/check in: When you arrive on race morning, you will get your helmet checked first, then proceed to check in. Parents will need to be with the kids for check in where you will get your race chip! A NOTE ON THE CHIP-TIMING DEVICE: The chip timer is disposable and will not need to be returned. You are free to keep this or throw it away after the race. You will need to wear this on your LEFT ankle. You want it to be tight enough that it doesn’t come off, but lose enough that it will not cut into your ankle if they swell a little bit from the bike and run. Transition area: the transition area opens on race morning at 0630. Please rack your bicycle at your assigned numbered space using the seat. Using your rack number as a guide, the front wheel will be down and on the same side of the rack as the number. The bike will be facing you and you will see your bike seat over your race number. (If this is confusing, it will make more sense when you watch the prerace briefing video and see the transition area in person at packet pick up.) Your gear is also on the same side as the number (by the wheel of your bike that’s on the ground/down). We will have transition area volunteers available to help you if needed. Parents are allowed to help racers set up but will NOT be able to enter transition after 0745 unless as an official volunteer until the end of the race. Course details: Mach 3 (13-15 year olds) race is first, followed by Mach 2 (9-12 year olds), then Mach 1 (under 8). Swim – the swim start will be based on division and race number. Mach 3 will have an in-water start. Mach 2 and 1 will be lined up and started six at a time, jumping in FEET FIRST--NO DIVING. Mach 3 will swim out to the second (farthest) pink buoy, keeping it on the right. Mach 2 will swim out to the first (closest) pink buoy, keeping it on the right. After making a right turn, they will then swim toward the bubble. Mach 1 will swim directly to the bubble after jumping in. There will be a pink buoy marking the finish. Bike - Bike out is at the front of the bubble (away from the water). Please ride on the right side of the road at all times, unless passing. When passing, pass to the left, then return to the right side of the road. Never ride side by side with another cyclist. Turns and turnarounds are clearly marked with signs and controlled by course sentries. As long as you do not ride off road, you’ll be on course! Mach 3 racers will ride three laps on the bike. Mach 2 racers will ride two laps on the bike. Mach 1 racers will ride the bike loop one time. Run - Run out is at the back of the bubble (right next to "swim in"). The run course follows a gravel road around the lake, through the parking lot and on the grass back to the bubble. Mach 3 racers will pass the finish line once before finishing on the second lap. Mach 2 and Mach 1 racers will run the loop one time before finishing. Finisher's "medals" and post-race food: upon completion of the race, finishers will be given a present from the race (made by Orange Spring Labs) and a bag with their post-race snack. That bag will also contain 2 tickets. One ticket will be for a free Iceworks shaved ice. The other ticket will be for a free drink with purchase at Manic Organic Food Truck. Food & Awards: Post race snacks, water, Powerade and a free 8oz shaved ice are provided to all racers. Additional food items (and shaved ice!) 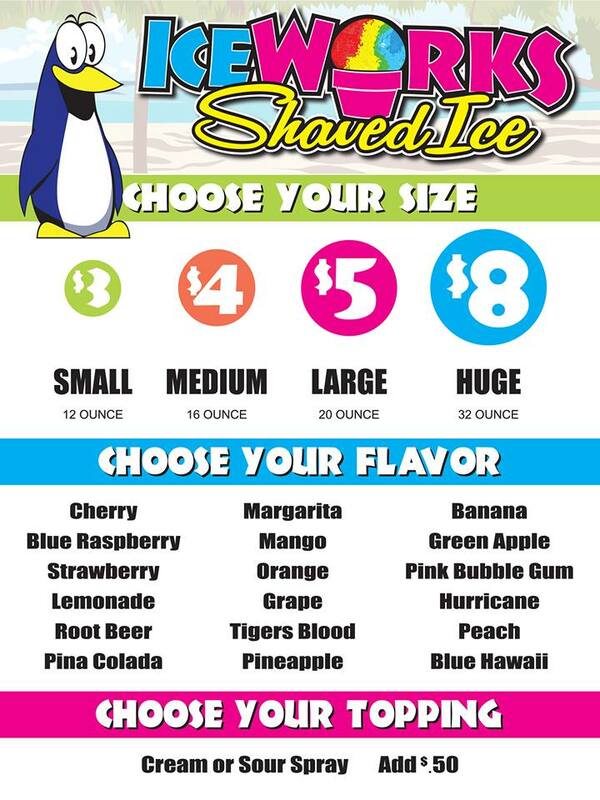 are available for purchase from Manic Organic Food Truck and Iceworks Shaved Ice. Participants will receive a free drink with purchase from Manic Organic. Awards will be presented as soon as possible after the last athlete finishes. NOTE: The Manic Organic Food Truck menu will be posted on Facebook Friday. They source the menu from local produce so the menu is always changing based on what’s available and looks yummy! -Make sure you get some good photos, this is a unique location that is not open to the public. ***please stay off the aircraft and equipment*** but you can stand in front of them or beside them all you want! Look for the Fly Tri banner for a great Please post the pictures to Facebook and Instagram. Use “#kidsflytrihuntsville”. -Visit the US Space and Rocket Center. -Wear your Race tattoos proudly and tell everyone what an awesome time you had in the triathlon you just did!! -Start planning for next year! !